Are you planning to buy a refrigerator and looking for energy saving options? If upfront cost for buying is not a concern for you then do look at refrigerators with inverter technology. Rest assured that the extra money you pay upfront will be recovered in the form of electricity savings. 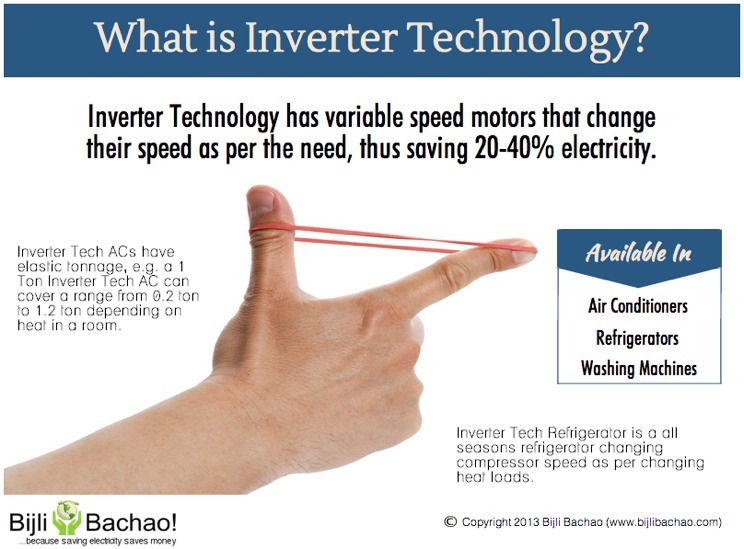 Inverter technology that was developed in Japan is the most efficient refrigeration technology available in the market today that can save up to 30-50% electricity consumed (units consumed) compared to regular refrigerators available. Whenever it is hot and we want to feel cooler, if we take a bath, we suddenly start feeling better. The moisture (or water) on our body evaporates by taking heat from our body and makes us feel cooler. Similarly in a refrigerator there is a refrigerant called HFC (Hydro Floro Carbon) that moves in the pipes or coils on the rear part of the refrigerator. When it is in a liquid form, it takes the heat from the refrigerator contents and evaporates to form gas there by cooling the things kept in the refrigerator. The gas is then compressed using a compressor to convert it into liquid again, and the cycle continues. The compressor uses electricity to do its job and is the most electricity consuming part of a refrigerator. Refrigerator also has a device called “Thermocouple” which senses the temperature inside the refrigerator and makes the compressor go “on” or “off”. The thermocouple works as per the temperature set in the refrigerator (yes you can set temperature in a refrigerator as well and we will explain it more in our other articles on refrigerators). How does a compressor in regular refrigerator work? Most compressors in regular refrigerators are single speed refrigerators. They are either “on” or “off” based on the temperature in the refrigerator and the setting in the thermocouple. Most compressors are designed to handle peak load conditions (for high temperatures in summers), which means that they run at peak load even in winters when the cooling requirement is less. Every time the refrigerator door is opened, heat enters the refrigerator and the compressor has to take care of this load as well. So most regular compressors are built to take care of peak load plus the “door open shut” load which during most of the year is much more than the actual requirement. How does a compressor with inverter technology work? A compressor with inverter technology works very much like a car accelerator. When the speed required is more, the acceleration is more, and when it is less, and then the acceleration is less. This makes sure that during summer months when cooling load is more, the compressor works at peak capacity taking more electricity. But during winter months when cooling load is less, the compressor works less there by consuming less electricity. Even in summer month, the night temperature is less than the day temperature and thus electricity savings happen in night when compressor can run at a lesser speed. In an “on” “off” cycle of a regular refrigerator, inside temperature varies throughout. But in case of inverter technology, temperature is more stable. The amount of noise made by the refrigerator is much less in refrigerators with inverter technology as compared to the regular ones. Energy or electricity consumption is much less when the temperature stabilizes. Although prices of inverter technology refrigerators are on a higher side, but they can save a good amount of electricity, there by helping you recover the money in your electricity bills. Regular motors need 3-4 times more current (more than running current) at startup. So the inverter/generator size needed to run any AC or Refrigerator increases significantly. But Inverter Technology air conditioners and refrigerators have variable speed motors that start up gradually needing much lesser current at startup. Thus the size of inverter/generator required to startup is less. For e.g. A 1.5 ton fixed speed AC that runs at about 10 Amp current may need up to 30 Amp current at startup and thus a 5 kVA inverter/generator. But an inverter technology Air Conditioner needs about 6-7 Amp current and not much more at startup and thus a 1.5 kVA or 2 kVA inverter/generator is good enough to support it. Regular motors have much lower power factor. In commercial and industrial connections there is penalty for low power factor and rebates for higher power factor. An inverter technology motor will have power factor close to unity (or 1) which not only results in lesser electricity consumption but also help get rebates on better power factor. If you are planning to use Solar PV for air conditioner, then it is the best to use inverter technology air conditioner or refrigerator as it not only reduces the size of PV panels because it consumes lesser electricity, it also reduces the size of inverter to be put along with the PV panel.